Delightful 1 1/2-inch tall mini-figures. Pack contains 5 Unicorno Frenzies figures. Figures are randomly selected and blind packaged. Clip them to your bag or backpack! From somewhere between the magical kingdom and our world, these delightful 1 1/2-inch tall plastic creatures are ready for play or display! 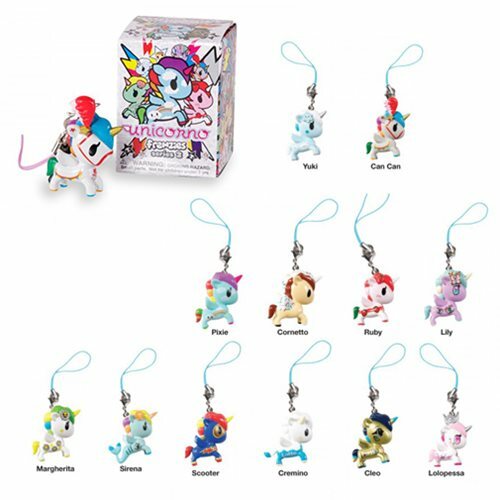 20 of the most popular Unicornos designs make up this assortment. Which ones will you get? Each figure includes a lanyard and a lobster clip so you can hang it on your bag, your backpack, or whatever! Ages 8 and up.